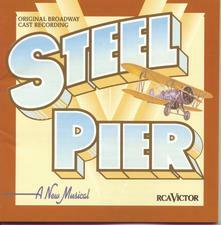 Conceived by Scott Ellis, who directed it, Susan Stroman, who choreographed it, and David Thompson, who wrote the book, Steel Pier took place in a dance hall in Atlantic City, in August, 1933, right in the middle of the great Depression, in a setting that recalled Sydney Pollack’s 1969 film, They Shoot Horses, Don’t They?, and gave its creators an opportunity to blend elements of real life and show business in a symbolic microcosm. Adding to their vision, John Kander and Fred Ebb, writing their last musical, delivered a score that matched in excitement the story of dancers vying for an elusive gratification at the end of a grueling marathon. With a brilliant cast that included among others Karen Ziemba, Daniel McDonald, Kristin Chenoweth making her Broadway debut, Valerie Wright, and the splendid Debra Monk, whose “Everybody’s Girl” became a show stopper, the musical should have been a hit. But it didn’t catch fire, and closed after 76 performances, following its premiere at the Broadway Theatre on April 24, 1997.